Unique and different! All people must agree with that sentence when they see this kind of chess piece. This unusual chess piece is kind of horse or knight chess piece. We try to make it different in order to get different touch than ordinary chess piece. We call it as 'Thai Horse' chess piece. Has different design than another horse or knight chess piece. Look its head! The horse looks shame and not show his teeth. 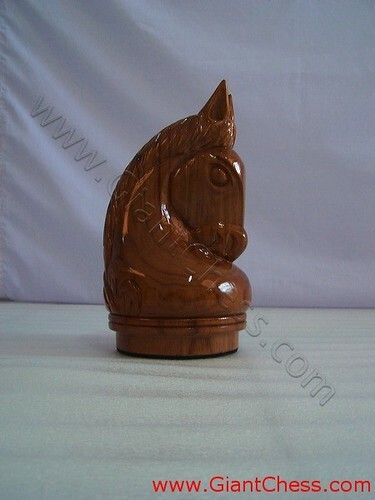 Beside as chess piece in your chess game, you can also use this kind of chess piece for your house decoration. To make your living room or your office feel different, you can lay this chess piece on your table or bookcase. It has made from Teak wood and carved carefully by our craftsman. Polished in natural brown color, make it looks elegant and stylish. Very durable for indoor and outdoor use.